THIS IS NOT THE FULL GAME, IT IS ONLY A WINESKIN WRAPPER. If you wish to play DuckTails, I firmly suggest you BUY it from the Steam Store. If you are unable to do so then save some money for it or obtain it another way at your own risk. Duck Tails is an actionplatformervideo game developed by Capcom and based on the Disney animated TV series of the same name. It was first released in North America for the Nintendo Entertainment System in 1989 and was later ported to the Game Boy in 1990 and in 2013 the game was remastered in HD for the PC , Xbox 360 , Ps3 , and Wii U . The story involves Scrooge McDuck traveling across the globe collecting treasure and outwitting his rival Flintheart Glomgold to become the world's richest duck. 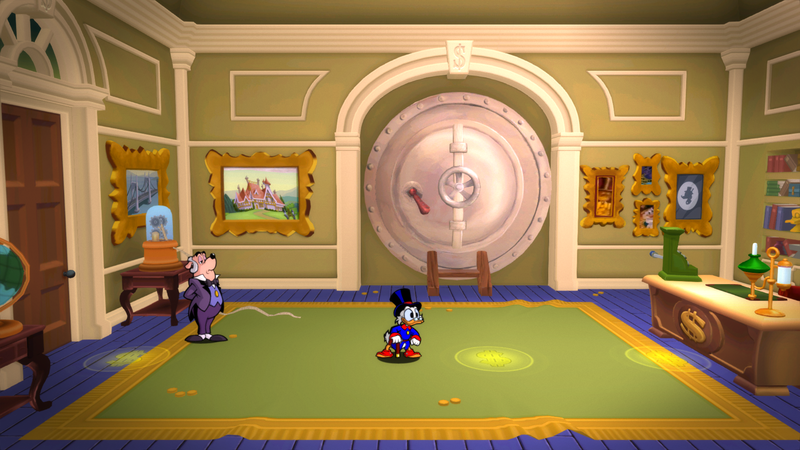 The game sees players in the role of Scrooge McDuck as he travels across the world in search of five treasures to further increase his fortune. 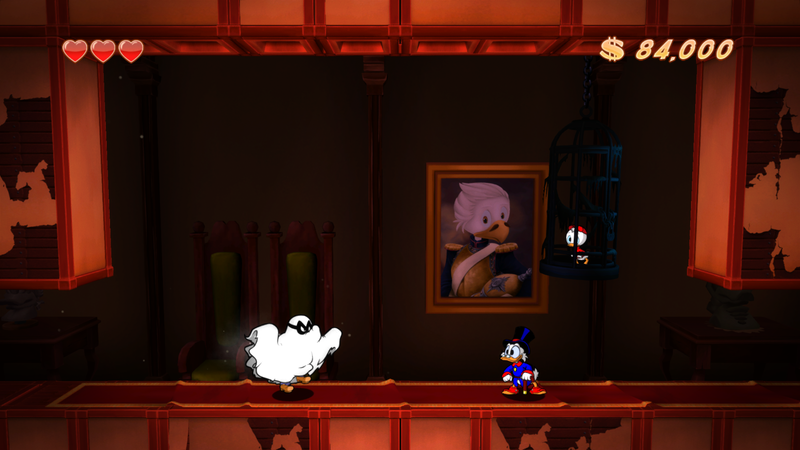 Scrooge is able to attack enemies and get around using his cane. 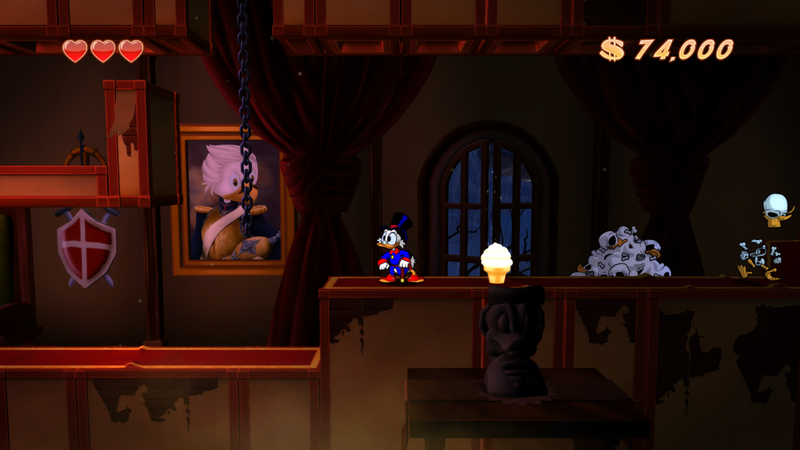 On the ground, Scrooge can swing his cane to attack enemies and break open or throw certain objects. 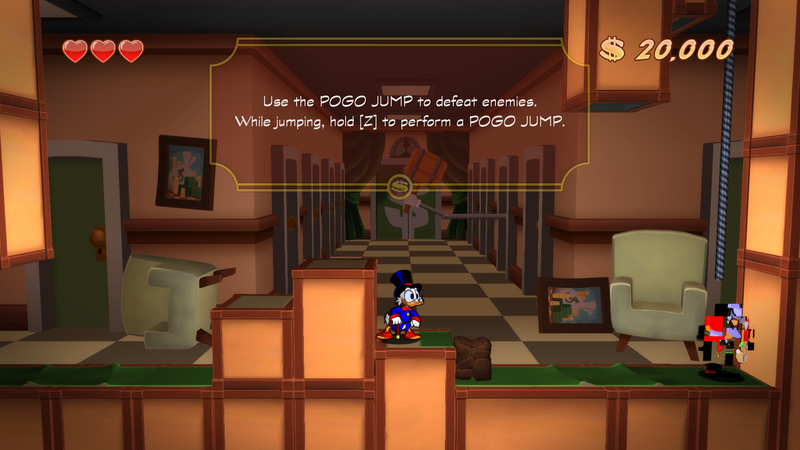 While jumping, Scrooge can bounce on his cane like a pogo stick to attack enemies from above. This also allows him to reach higher areas, as well as bounce across hazardous areas that would hurt him on foot. Along the way, Scrooge can find various diamonds, found in treasure chests or appearing in certain areas, to increase his fortune and ice cream that can restore his health. 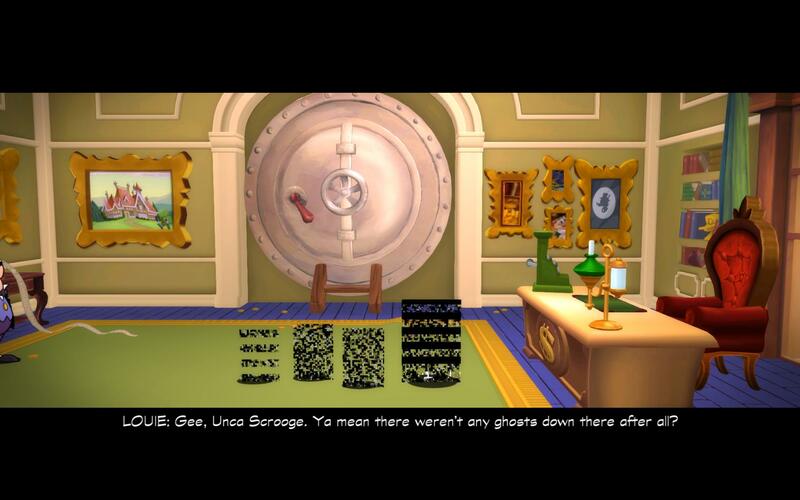 Scrooge will also encounter various characters from the series who have various roles, such as providing hints, offering up items and opening up new areas. The glitches only effect nvidia users in wine . It works fine on intel HD 4000 and most AMD cards . If you have a MBP with the 650m and want to play the game in wine , then download this wrapper and then switch over to HD 4000 Graphics ( http://gfx.io ) rather then using your nvidia chipset . Heres some screenshots of the game running on HD 4000 in mac osx . couldnt get the xbox 360 controller to work, anyone have the same issue? Good, Hmtinc, I know that these kinds of questions were maybe better to be sent to the Tutorials-section, but I'm new at using wrappers for Steam games and I would appreciate some help from the port's original maker. My problem is, that when ever I try to launch the wrapper Ducktales Remastered-folder inside the program files-folder the game crashes instantly. I tried several tools like Steamloader and RevEmu, like at the tutorials section are told to do, but they didn't help at all. I also tried to find a cracked DuckTales.exe file to "fix" the original one, but right now there is no such a thing available. Yup, having the same issue here. Any suggestions? I dont really have a Xbox controller , so i cant really help , but if you search the forums you may find a answer . If you can't figure it out after a while , I suggest you just get the free version of controller mate (http://www.orderedby...controllermate/) and map the game keys to the proper xbox buttons . This site does not endorse piracy, so i can not link you to a crack for duck tails (Yes , a crack does exist ) . If you own the steam version then you don't need a crack for the game . Just follow the directions below if you own the steam version . Hey, thanks! That solved the problem! The game works almost perfectly with no graphical issues or glitches. Only sounds do not work. The game is completely silent. Could you please tell me if there is a way to fix it or if I'm just doing something wrong? At first, thanks a lot for this wrapper. But I am also having these graphic glitches which make the game unenjoyable to play. I have a MacBook Pro Retina mid 2012 with Intel HD 4000 + GeForce GT 650 and i was wondering if there isn't another way to force the game to use the Intel card instead of the GeForce - WITHOUT using 3rd party Apps like gfxstatus. So, is there a wine command line for that? And apart from that the game is always using the MacBook display instead of my Thunderbolt display. It's the first wine-game I ever played which doesn't use the thunderbolt display by default. Is there an option to change the display? Oh, and as I just noticed, the music is missing ... just checked out a youtube gameplay video where you can hear the title theme, which I don't hear in my wine version. How I fixed my sound. â€‹3. Click "Config Utility" under the Wine Tools column. 5. Change all the drop down boxes to Built-in Output or Built-in Microphone. 6. Click test audio and you should hear the test sound. 7. Apply the settings and close the window. 8. Close Wineskin and relaunch the app. 9. Sound should now wrk in the game!!! Hey hmtinc, I am on a IMac with a Nvidia Gt640M, should I use http://gfx.io (if the answer is yes can you tell me how to switch to HD 4000), or use your step posted above? GFXCardStatus does not support iMacs. Only Macbook Pros. It doesn't run at all... We are out of luck unless bug fixes in Wine or graphics drivers are forthcoming. I too have an iMac only with a GTX680MX 2GB GPU... I get the same glitches. Also, my 360 controller worked just fine using the x360cemu... IIRC this wrapper includes it.. so those of you who it doesn't work for probably didn't merge the folder properly. No need to use keyboard emulation with this. The last two things seemed to be what did it for me. I probably should have done the last two things one at a time but either way it fixed it for me. Also, I'm running the game with FXAA Tool for a few graphics enhancements so I have d3dx9_43, d3dcompiler_43 and the FXAA Tool's d3d9 in the binary folder and set to native to satisfy that utilities requirements but the fix I mention above was still necessary. Installing d3dx9_27 fixed the graphics in my re-port of Kung Fu Panda for me so I put the same dll into Duck Tales Remastered and set it to native. But again... I didn't notice any fix until I did the last two things in my list... strictdrawordereing=enabled and rtlm=textex... I have a feeling it's probably the former that did it. Unlike with some other games Duck Tales is such a lo-fi game that turning that on doesn't affect performance. At least not on my rig. *edit* I've confirmed that strictdrawordering is what does the trick with this game and Nvidia cards. You could probably get by with Mutisampling on and Strictdrawordering on... the former mostly if you want antialiasing. Tetsu, you are a prince among men. Thanks so much for sharing the sprite flicker fix! Enabling strictdrawordering did the trick for me.